Instant Vibes returns with another release and yet another new signing to the label family. The seventh outing on Krafty Kuts label comes in the form of ‘Horse Music’, which has been crafted by Bird Peterson. In true Instant Vibes fashion, the remix artists are some of the biggest and best up-and-coming producers in the dance scene right now. Bird Peterson hails from Austin Texas and has had numerous amounts of success on labels such as Mad Decent, Teenage Riot Records and BP Americo, but now he shows his love of disco infused house beats. 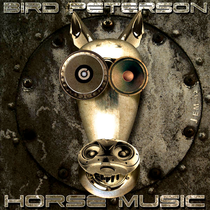 ‘Horse Music’ leads you into a false sense of security with the disco tinged intro, which makes you reminisce the good old days of The Big Beat Boutique, then it hits you full square in the face with its hammering kicks and subsonic low-end frequencies. First on remix duties is label head honcho, Krafty Kuts. Krafty is no stranger to remixing some of the world’s biggest tracks and he does not disappoint with his latest installment. Whilst flipping the original on its head and giving it a badboy garage flavour, Krafty keeps that disco edge which sits perfectly on the peak time drop. Jay Robinson delivers some tropical vibes whilst still keeping his well-known floor rattling basslines full in the mix. ‘Hot Right Now’ producer Rory Lyons executes a late night twisted house remix and, completing the five track package, Bobby C Sound TV slows things down in time for the early night DJs to fill the dance floor with his take on the original.